Confession time: the plan for summer 2015 originally wasn’t to go to Stratford, but visit Scotland and spare ourselves the jetlag. 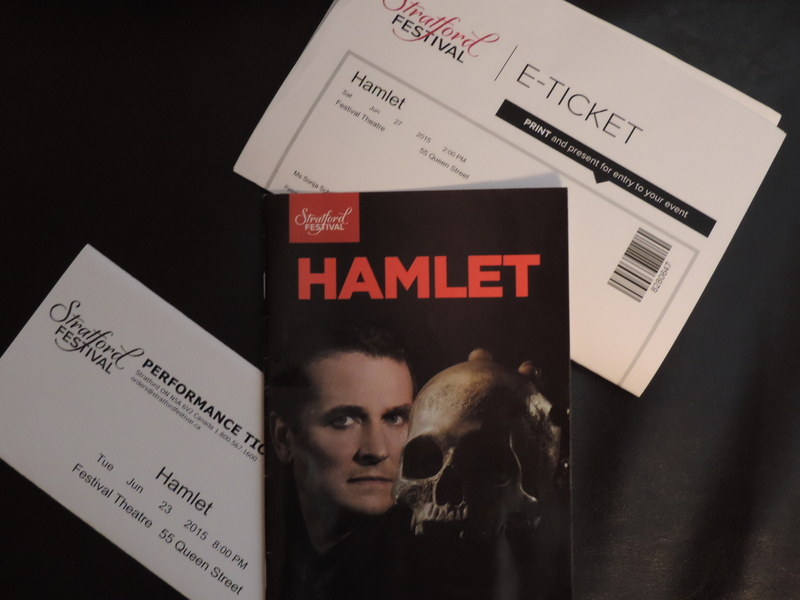 Then during our stay in Stratford last year, Hamlet was announced to be on the playbill in 2015 and those who know me well will attest to the fact that I am physically unable to stay away from a production of this play. To make matters worse, a few days later news got out that the title role had gone to Jonathan Goad and I distinctly remember saying I would like to see him as Hamlet in a few years when we walked out of the Patterson after Othello in 2007. Bye bye fried Mars bars, hello Paulette Bunyon. The threat of disappointment is always there when you’re looking forward to a production (or anything really) that much; in this case especially because – as you might have guessed from the name of this blog – it’s my favourite play. When more and more of the cast were announced, I got positively giddy and while I tried to stay away from the reviews to avoid production spoilers as much as possible (I shouldn’t have bothered as the lecture in the Festival Theatre right before the bloody performance didn’t have any qualms about giving major ones away), it looked good so far. Hamlet is probably the play that people project most into and everyone has their own take on how it should be performed. Whenever I read it, I thought it was as hilarious as tragic. Unfortunately, a lot of companies seem to prefer their Hamlet more broody than witty and are eshewing humour for seriousness. Or maybe I’m just reading it wrong. I’m also one of the apparently few (at least in the Hamlet MOOC I did earlier this year) that don’t think Hamlet is mad, bipolar or suffering from an Oedipus complex. In fact, I always considered him about the sanest person in the play and never had an issue with him hesitating to kill Claudius because I don’t think killing someone should come easy to a human being. The Hamlet productions I’ve seen so far rate from okay to good to great (Stratford 2008 and Young Vic 2011), but this was the one I have been waiting for for more than 20 years. It is really funny- not just Tom Rooney who is killing it as Polonius without turning the character into a caricature, but also Goad’s sarcastic and dynamicHamlet, Polonius‘ eye rolling children Laertes (Mike Shara) and Ophelia (Adrienne Gould) as well as Rosenkrantz and Guildenstern. Of course it’s not all fun and games and everyone gets to show off their range when fun and games give way to madness, rage, death and revenge. Adrienne Gould already had played Ophelia in the 2008 production and was doing just fine, but this time, she really went all in. Gertrude (Seana McKenna) and Claudius (Geraint Wyn Davis) were like teenagers in love, with Wyn Davis switching seemlessly to murderous schemer and McKenna being naively maternal right up to her demise brought on by her one single act of defiance. The only character that was too pale for me was Horatio. Tim Campbell came and went, but never really left an impression, sadly not even at the very end. The rest of the company showed how much of a difference delivery, speed and facial expressions can make for lines that millions of people think they know by heart and this way keep a play fresh after more than 400 years. While Antoni Cimolino’s production is – as always – not going to please everyone, I am really looking forward to seeing it a second time tomorrow. Thank you to all involved, this truly is the Hamlet I had been waiting for. Update after second viewing: still brilliant; nope, Horatio is still Hamlet’s accountant and a boy sitting behind our friend exclaimed ‘Now I get it!’. I’d say the latter alone would be ‘mission accomplished’. This entry was posted in Live, Reviews, Stratford Festival (Canada) and tagged Adrienne Gould, Andrew Robinson, Antoni Cimolino, Brad Rudy, Brian Tree, Canada, Derek Moran, Festival Theatre, Geraint Wyn Davies, Hamlet, Ijeoma Emesowum, Jennifer Mogbock, John Kirkpatrick, Jonathan Goad, Josh Jonston, Josue Laboucane, Juan Chioran, Mike Nadajewski, Mike Shara, Ontario, Robert King, Sanjay Talwar, Sarah Afful, Seana McKenna, Shruti Kothari, Steve Ross, Stratford, Stratford Festival, Thomas Olajide, Tiffany Claire Martin, Tim Campbell, Tom Rooney, Xuan Fraser. Bookmark the permalink.